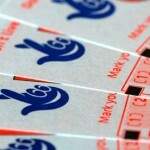 When the lottery officials decided to double the price of tickets to $2, the players got the announcement with mixed feelings but it appears to have been all for the better. One thing is certain, and that’s that this action made it possible for the jackpots to hit the $500 million barrier and one lucky player will have the chance of scooping the jackpot on Wednesday night. In 2012, the sales for Powerball tickets rose to almost $4 billion and it is expected to exceed 5 billion by the end of the year. While the facts are impressive, players are more concerned about whether there will be a winner on Wednesday or not. Surprising as it might sound, since October 6, nobody won the jackpot and with each week the number of tickets sold increased. On Saturday the prize was standing at $325 million, with the prediction for this week being 100 million more, but even the most optimistic ones were humbled by the results. The jackpot was revised to $500 millions and if someone wins it, this will be the second largest ever prize in lottery history. 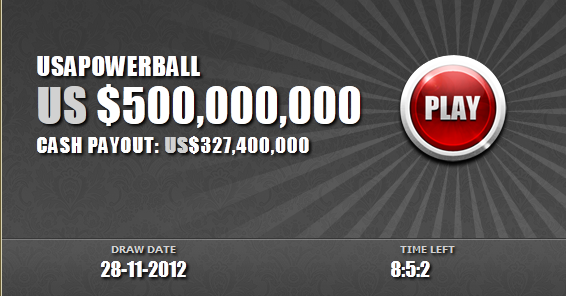 The current record is held by the Mega Millions jackpot won earlier this year, in March. Back then, players had to wait for nine consecutive weeks until three lucky players from different states finally predicted the winning numbers and received a bit over $200 million. This means that if only one or two players predict the lucky numbers, this would be the largest net winning ever to be awarded by lottery. 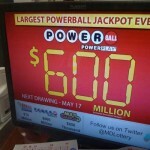 While the well-being of the players is among the concerns of lottery officials, the priority is to raise more money for the states that participate in the Powerball competition. Now that the cost of a Powerball ticket was raised to two dollars, only half of the amount will go towards the prize pool and the rest is kept by the lottery. Depending on what the state authorities decide, the money can go to fund arts, education or different nonprofit organizations. The government is also among the main beneficiaries, because whenever someone wins the jackpot this is subject to taxation and 25% is held by the federal government. In addition to these taxes, the winner will be stripped by an additional 6% as state taxes, and sometimes the city also keeps a few percent. Powerball and Mega Millions are played in 42 states and with the number of participants growing every year both the winners and the authorities win larger amounts. In this context it is very likely for the current record to be shattered and prizes in excess of $700 million to be soon awarded. Right now those who purchased Powerball tickets for the Wednesday draw have an excellent chance of becoming the largest single lottery winners worldwide.